With Nebraska being hit hard recently by devastating flooding a group of Ohioans heard the call to aid rural Nebraska during the aftermath. The Ohio Rural America Relief Efforts group has been in contact with several farmers in Nebraska as well as their state department of agriculture, who is helping to coordinate relief. A list of much needed supplies has been put together to help those impacted and several locations across the state have been set up to collect those supplies. The group has also put together a crew to transport supplies on Friday, March 29th and stay to volunteer until March 31st. You can drop off donations at our Corporate office (813 Clark Ave, Ashland, OH) on March 21-22 and March 25-26 from 8am-5pm. For more drop off locations, click here. 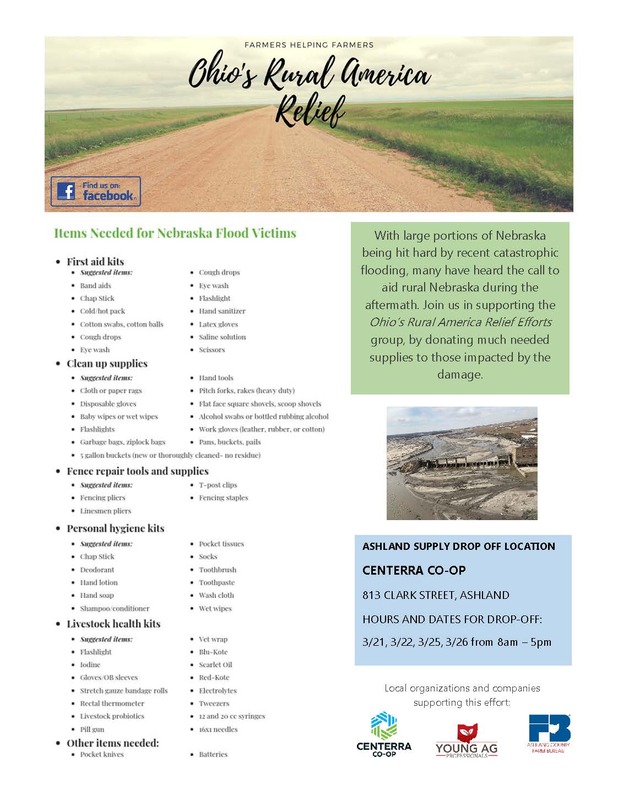 If you’d like to directly donate to farmers and ranchers impacted by the flooding, you can do so through Nebraska Farm Bureau. Stay up-to-date through the Nebraska Emergency Management Agency. For more information on about the Ohio’s Rural Relief Efforts and how you can help visit their website or check out their Facebook page.